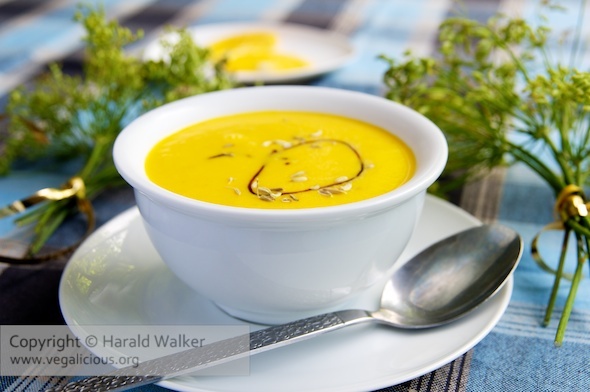 This is a lovely soup, mild yet flavorful with a lovely creamy consistency and a bright color. Heat the oil in a large soup pot. Add the sliced fennel, garlic and sliced carrots. Saute the vegetables until they begin to soften. Add the water, salt and pepper and 1 tablespoon ground fennel seeds. Bring to a boil, then turn down to a soft simmer. Cook the soup until the vegetables are soft (about 15-20 Minutes). Add the orange juice and puree the soup to a smooth creamy consistency. Season to taste with additional, salt, pepper or fennel. 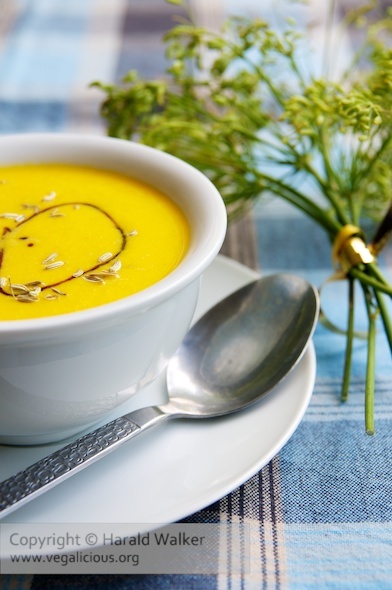 We garnished the soup with a drizzle of balsamic vinegar and fennel seeds. Posted by Chris Walker on August 26, 2011 in Carrot, Fennel, Orange, Soups.